There's been some debate about what constitutes a slide at Val's group: http://iuoma-network.ning.com/group/arty-slides-international?xg_source=activity. In this 4X4 paper piece, Suus has combined her zentangle style with the feel of large format slides. It looks like Suus used a metallic pen or tube of paint to seperate the cow image from the zentangle - it feels like the edge of a metal slide. I love the way she's also created frames around her words. 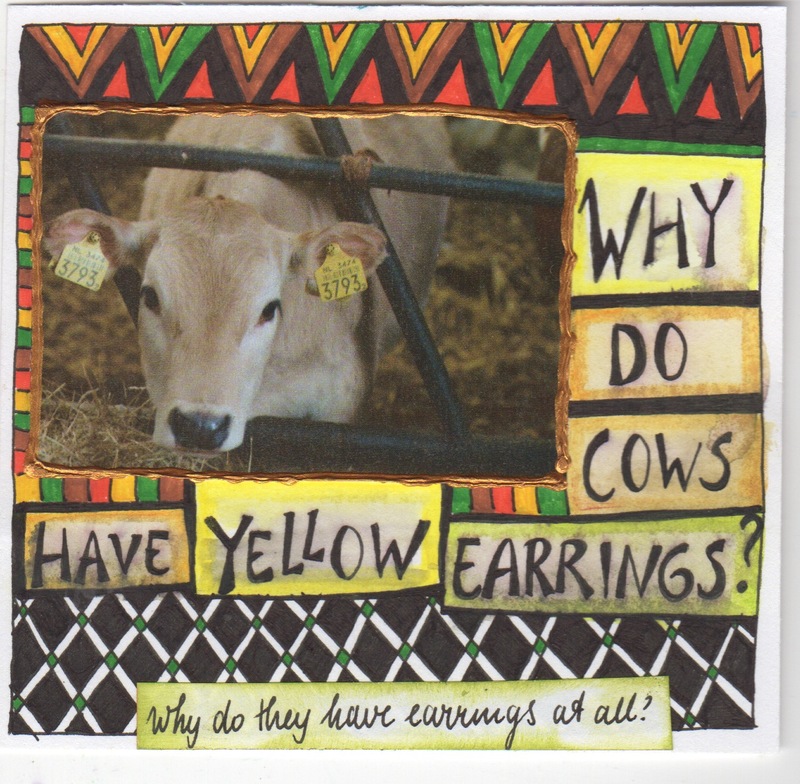 What Suus asks, at first, seems like a silly, funny question, 'why do cows have yellow earrings?' 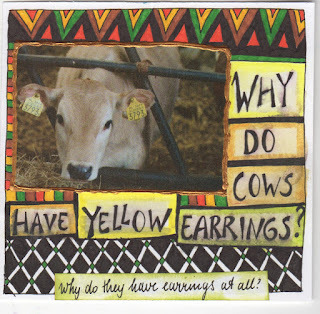 But once you look carefully and see what she's talking about and you read her second question, 'why do they have earrings at all?' you realise Suus is making a social comment. Although it would have been tragic if this had been damaged by the postal system, this one would have really been doing its job if it were a postcard, traveling for all to see! Still I'm glad it's mine and arrived in its pristine condition. Thank you Suus. Very funny Marie and it looks happeir than Suus' sweet creature. Having said that, I am terrified of cows... but not as frightened as my sister who verges on cow phobia. when I lived in Kenya I ran every morning and went through herds? of cows. They would watch me - a funny sight I'm sure in a long dress in the Kerio Valley. At first it felt like they were charging and I would run that little bit faster. Then I got braver and felt almost as though the cows were my friends. In Engand people get smushed by them annually.